I just read Dave Lanovaz’s request for help making group work in a math class effective, and I was writing a comment when I realized it was going to be a long one, so I decided to blog about it instead. I use group work in my math class a fair bit so I have some suggestions for Dave. 1. The assignment students are expected to do must obviously break down into separate discrete tasks that each person can work on. You can’t assume that a task that 1 person could do will be more efficient because 4 people are doing it. 2. The tasks need to be things which can be worked on in parallel. The worst type of group work is done in series with each person contributing part of the work one after another. 3. Use a system which makes each student contributing to the project independently easy, like Google Docs for example. This way the students will have to do less managing of meeting to do the work and passing around paper. 5. You can’t really use a mark from work assigned in a group and use it as an assessment of an individual student’s progress. My recommendation is to make sure that there is some other reason why the project needs to be done, some other motivator besides grades, and don’t grade the assignment at all. 6. Initially, you should be in charge of the groups. Students who aren’t used to working together are not likely to choose the best people for their group. Once students develop some proficiency and cooperation skills, you can let them mix and match more often. Yes, this isn’t very democratic, but then if you’ve ever witnessed question period in Canada, you’ll know that democracy != cooperation. 7. Small groups work better than large groups. 2 or 3 people working together is easier to manage than 4 or 5 people. 8. Discuss your expectations ahead of time. "What are our beliefs? Why are we doing group work? How will this help us learn?" Make sure the kids understand the purpose behind the group and make sure YOU understand the purpose behind it. 9. Watch your colleagues who use group work a lot and see what they do. They’ll have picked up tricks and tips I haven’t mentioned, and can support you in making group work a useful part of your teaching repertoire. 10. Keep trying. You won’t get group work to be effective the first time you do it, or possibly the 10th time you try it. It’s not easy to manage, but you get better at it, and once you have students working together effectively, there are lots of learning dividends. Think of the time you put into learning this instructional technique as an investment in your pedagogy. Thanks to Chris Kennedy ( @chrkennedy on Twitter), who is blogging at his Culture of Yes blog, I have a list of BC educators who blog. Chris makes the good point that we should follow the local bloggers in our area and also find out what is happening in our neighbourhood. As interesting as the international conversation, it is equally important to each us what happens near us. I’d love to see a service which attempted to map blogs by location of the author(s) and general topic area… has anyone got a list of their local bloggers? We often spend a lot of time telling people what they can’t do. (Picture shared by my sister). We should spend more time talking about what people can do. When we frame everything in the negative, people tend to put themselves inside the box you’ve constructed for them. If you frame in the positive, they are more likely to see the world through the same lens you do. If you have a set of classroom rules, think about how you can frame your reasons for those rules as positive beliefs, and share those beliefs with your students. Those beliefs become your new discussion about the world, and how your classroom within our world should operate. There is a lot of discussion of how we can personalize education for students and give them opportunities for choice. The idea is that students who have choice in the learning process will be more engaged. Personalized learning, where the delivery of the curriculum is tailored to individual student’s needs, will also likely lead to students understanding the curriculum standards. Both of these suggestions seem reasonable. Some educators suggest that students can present evidence of their learning in a variety of ways so allow students to choose whatever form of assessment they want. If a student prefers to work with video, they can create a video. If they prefer to take a test, they are given a test. If they want to write an essay, they write an essay. The idea is that they can present what they know in the medium they want. On the outside, this looks like student choice and this is a good start. Alternatively, some schools offer electives for students to take. Students can choose from a selection of additional optional courses aside from their required academic courses. Unfortunately these courses are typically being cut back as schools face budget short falls. It’s too bad that these cuts are happening because these courses are another step in the right direction. Students can choose to take athletics, participate in after school clubs, perform in the school play, play a musical instrument, or a variety of other activities. These opportunities are terrific, but they are still just replacements for real student choice. The problem is that all of these are superficial opportunities for choice. They are all an illusion of choice. At the end of the day, students are greatly restricted in what they learn, and when they learn it. Each year is packed full of state-mandated curriculum and course content chosen by educators. Students spend their evening exploring the world through their Internet browser and come to school to find arbitrary walls have been placed between them and the world by well-meaning educators. Students lack the most important choice in school, what they learn. Choosing what you learn is a powerful motivator. Ask someone who has mastered a musical instrument, or learned to build dynamic websites, or any one of a million possible challenging things. We educators have all experienced what it feels like when you learn something new, we know that it is a powerful drug. Why are we withholding this opportunity from our students? Isn’t it possible to give students real choices about what they learn? Our school uses a school-wide behaviour management system called "Real Restitution". It’s not really about behaviour management though, that’s not the best word for it. Think of it as a constructivist approach to behaviour management. In the behaviourist model of learning, students are like little black boxes where you don’t care what’s going on inside the student, what you care about is how you can manage their behaviour so that they demonstrate they have learned what you want them to know. As far as I know, most teachers no longer believe that this model of learning is correct, and so have moved onto the constructivist model of learning. In the constructivist model, students construct meaning from what they experience by attaching each new idea into their existing framework of understanding. What does the constructivist model look like when applied to behaviour management? This is exactly the type of thing you would expect a behaviourist model to excel at, since all you are concerned about is how students act. However it is my experience that teaching students how to respect each other, you, and the school is not something you can do successfully if you treat each student like they are a widget in your factory. You can’t treat students like they are a black box with no emotions inside. The Restitution model of school-wide discipline is about remembering that the students we deal with on a daily basis are people. They have thoughts, feelings, emotions, and quite often their reasons for "misbehaving" have nothing to do with what is going on in your class. If you want students to behave sensibly in your class, you need to remember that this is a skill that they are learning and that learning it will require students to build connections between what they know or have experience at home or in other schools, and what you want them to know. We had a two session to learn about Restitution at our school and how we could implement it. What we did was examine some other classroom management techniques, talk about their flaws, and then talk about some ways we could improve our approach. According to what we learned from Diane Gossen’s model of classroom discipline, there are 5 basic models of classroom discipline. 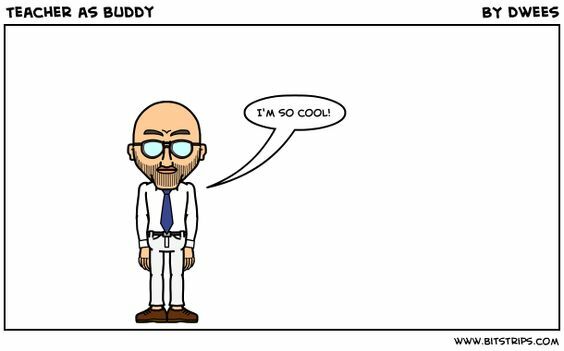 The teacher as buddy tries to make the students their friends. Their objective is to make the students like them, and if they do, then they think classroom management will be easier. The problem with being the students’ buddy is that you can never deliver any consequences for misbehaviour since none of the students will take you seriously. I’m not saying that being supportive of students and appreciating them for who they are is okay, but you aren’t their friend and shouldn’t act like it. I used to get mad with my students when they did not behave in the way I wanted. It was frustrating for me, and everyday (almost) I would go home and bring that anger with me. I was the punisher. Generally your students are not misbehaving because of what you are doing. Sometimes this might be true, and we all need to examine our practices when we get feedback on them from students, but often the source of the misbehaviour is outside of your room. Don’t get mad at the students. It’s not worth it. Some teachers use making students feel guilty as their classroom management strategy. This is ineffective for a number of reasons. First, students may just not buy it. After all, they’ve been sold guilt before and nothing happened when they continued to act out. If the student doesn’t believe that they should feel guilty for what they have done, they’ll probably feign an apology, and then continue to act poorly. Second, it can hurt the student-teacher relationship. If our objective is to act as compassionate adults around our students, we should not turn to an immature approach when they struggle. Teacher as manager is where I’ve spent a lot of my career. I focused on making sure students knew what the classroom rules were, and what the consequences would be for breaking them. I ignored a serious flaw in this model. 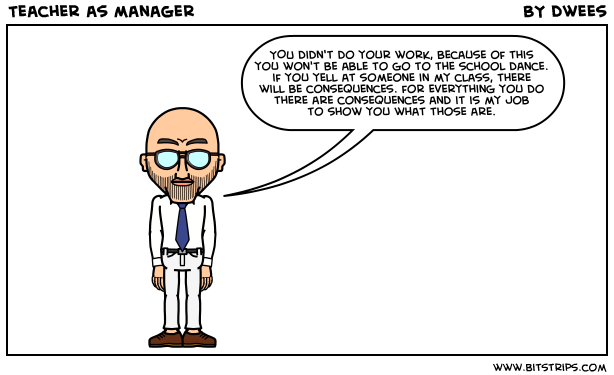 The problem is the teacher is the manager, and the student is assumed not to be able to manage their own behaviour. The teacher acts as an external source of the rules, and the student is expected to obey that source or face the consequences. Some students will manage to internalize those rules and know how they are expected to act but many students will ignore the rules when the teacher isn’t around. If you’ve ever been a substitute teacher, you’ll know what I mean. The role of a teacher should be to monitor student behaviour and to act as a feedback mechanism so that the students learn from their mistakes. Students will make mistakes, and you have to let them make those mistakes. You also need to provide them opportunities to make amends for the mistakes they have made. When you act a monitor, you are focused on your shared goals with the student, which you need to take the time to establish. Students who recognize that the objective of consequences and other forms of behaviour correction strategies are there to help them achieve whatever goals they have for the future are more likely to buy in, especially if they have had input into what the goals should be. One of the first steps to establishing yourself as a classroom monitor is to come to a collective set of shared beliefs with your students, and establish community wide "bottom-lines." A "bottom-line" is a school rule you have which your school believes has to be in place for the school to function. This might mean, "no fighting" or "no smoking" or whatever rules you have which you cannot allow students to break. For these rules, you always resort to acting as the manager, and apply appropriate consequences. Once the consequences have been meted out however, you now switch back to the monitor role and help the student transition back into the community. Here’s an example of what restitution might look like. This person obviously has a lot of time, maybe more time than you have as a classroom teacher, but I’m sure you can see how you could incorporate this into your daily practice. Your administrator, or a fellow teacher on a preparation period, might be able to have the necessary longer conversations, but you can do a very similar approach in a 1 minute conversation. In the Restitution model of school-wide discipline, teachers switch between being monitors and managers depending on the context of the situation and whether or not your school’s bottom lines have been passed. We allow students to make mistakes but provide feedback on those mistakes while continuing to validate the individual, and respect who they are. This model also allows students to construct meaning from their mistakes, and to see themselves as a valuable member of the community. Recognizing that you’ve made a mistake I think is a critical life skill, and one many adults seem to lack. Your overall objective is to product a person who understands the reasons behind the rules, and has internalized a set of rules for themself. Hopefully these are rules they have constructed for themselves! If this is your objective, then you have to recognize that being able to control one’s self is an important skill for students to learn, and one that they are unlikely to learn without the chance to make mistakes, and more importantly, to recognize their mistakes and make amends for them. Today I had an interesting request come from a couple of my students. I just wanted to share. Is this how you would have handled it? "Mr. Wees we have a problem," said a pair of my students. "What’s the problem?" I responded while I was setting up my LCD projector for the brief video I wanted to share. "Well, we we’re wondering if we could take class time to work on our Global Gathering presentation we are doing tonight. We promise that we will have our rough draft of our projects ready for Monday! We want to work on what is more important right now, since the presentation is happening tonight." I thought about it. I mean, I understand their position. I want to work on more immediate deadlines too when I’m in a similar situation. I was just planning on giving them class time to work on their projects, after introducing the idea of flipping our classroom. The two girls said nothing. I hadn’t said something which sounded like a positive response, but it sound negative either, so they were confused. "Look," I continued, "you’ve got an idea and I’m listening to the idea. This means we’ve entered into negotiation. You want to change my side of the equation, but remember our rules of algebra. Whatever we do to one side of the equation, we have to do to the other." "Oh…well we can bring you in cookies or something," one of the girls offered. "Don’t change the units. You’re asking me to give up class time so you can work on something you should have done yesterday or earlier this week. You have to negotiate in the same units." "Okay." They thought about it. You could see the wheels turning as they tried to find an appropriate bargaining chip. "Well, we normally have a study block Tuesday mornings. Could we promise that we will come in and meet with you about math on Tuesday instead of now? That would be fair right?" Well aside from the fact that I’ll have to supervise an extra class, yeah it’s pretty fair. I’ll sacrifice some of my time next week if it means our fund-raiser this evening for our Kipevu project goes smoother. "That sounds fair. See, now you’ve both become better negotiators. So you promise that if I give you the time to work on your deadline for today now, that you’ll give me back some of your time later to work on math?" I clarified. Today I started flip teaching. This is a process where I put up videos of the content we are going to cover for the students to review at night, and use class time exclusively for practice and activities. To be honest, I’m pretty nervous about it. It will be one of the most radical changes in my teaching practice since I started collaborative learning in the classroom. When I introduced the idea to the students, I talked about the structure of our class, and some problems with traditional homework. Basically, I said that if I send them home with exercises to do, then they’ll be doing needless practice or struggling needlessly, depending on whether they get it, or don’t get it respectively. Since our school requires that I give them homework, my compromise is that I will send them home to watch a short (I’m hoping I can keep the videos to under 8 minutes each) video tutorial that I’ve created myself on a topic. I then shared an example I made with them, and asked them to be critical of the example, and look at ways I can improve the process. After all, if this works out as I hope it will, they will spend a lot of time at home watching these videos, so the videos should work for them. Unfortunately, about half-way through the video, the audio died. Turns out that it was the speakers I was using and not the video itself, but their first piece of feedback was to fix the audio. They also asked me to add more colour, particularly when talking about the formulas and equations themselves, to make sure I took the time to define terms I use in the videos, and to add a "common questions" section at the end of the video. I asked the students to be watching the videos "actively" as if they were participating in a lecture. I said, "If you get a text message from your friend while watching the video, either pause the video and get back to it later, including rewinding it if necessary, or ignore the text message." I also asked them to add comments underneath the videos, both to help me improve the creation of the videos itself, and to ask questions about what they are seeing. I also asked them to bring any questions they have to class. Here is the video I shared. I’ve gotten feedback from the students about it. After watching it in class, I can see some other things I can do to improve it (in every sentence practically, I drop off in volume…) but I’m also looking for some feedback from other sources, so I’ve embedded the video below. Simple and Compound Interest Review from David Wees on Vimeo. This morning I watched part of a conversation about teaching practices, and application of constructivism to those teaching practices, between @teachpaperless and @drtimony. It started with a question put out by @teachpaperless to no one in particular, just to all of his Twitter followers. @drtimony responded pretty quickly. I’d say from the way Shelly phrased the question, and the response from @drtimony, that these two gentlemen have a lot of agreement on this topic. Their conversation continued from there. This is in reverse order, since they how it can be viewed on Twitter, so I recommend starting from the bottom and then reading up. Both of these people are deep thinkers. They actively deconstruct other people’s ideas and challenge contemporary models of viewing learning. In my opinion, they are both educational theorist leaders. While neither has the cultural authority and historical context of either Bruner or Piaget, maybe one day one or both of them might. I would not be surprised. While I was watching the exchange, I felt compelled to jump in, and I did, and both of them responded to my query. The point is, Twitter enabled this conversation to happen, and allowed me to both be a passive observer, or an active participant. The choice was up to me. This is a lot like reading a series of letters between two great thinkers, but then being able to add to their conversation and ask questions. What a difference the technology here makes to the conversation itself! What would a conversation between Bruner and Piaget looked like, if it had ever happened? Will future historians look back on conversations like these and wonder how ever survived without them? This is a video that was shared with me of an autistic child I know singing. He doesn’t have as large a vocabulary yet compared to other children his age but he listens to a lot of music and loves it. I’ve listened to a few children sing at this age, and while most of them have better pronunciation of what they are saying, few of them have tonality yet in their singing. I’m amazed by the progress this little guy has made in the last year. The woman he is living with is doing an awesome job with him, and I’m constantly grateful for her involvement in his life. She has found a gift he has and based on what I saw a year ago, I didn’t think that would happen. I really believe now that every child has a talent for something, and that it is our job as educators to find these talents. We need to expose children to experiences in life which will help them uncover their talent. My school recently purchased two class sets of clickers which have already started seeing use in the classroom, mostly with teachers who were part of the trial last year. My thought? They will probably change how I teach as the amount of authentic feedback I can get back from students can be greatly increased, especially as I find ways of making the questions I ask through clickers more effective. Here’s a presentation I just found which describes what clickers are, and then gives some potential uses. View more presentations from Russell James. I’ve noticed some issues with using clickers that I should point out. Students need to learn how to use them. This doesn’t take too long, but expect some occasional gaming of the system and inappropriate responses if you allow for text responses. You need to take more time to prepare your lessons with the use of the clickers in mind. 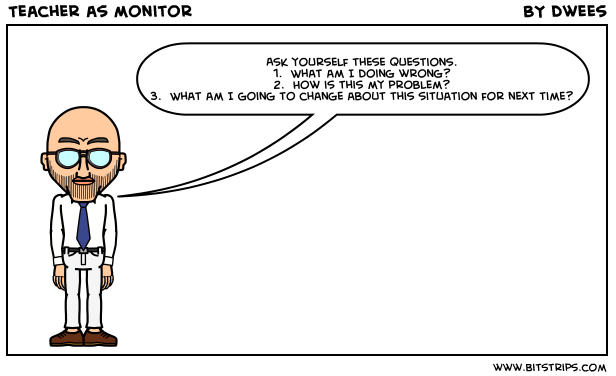 You have to establish questions ahead of time as the on-the-fly questions really can be difficult to ask in advance. One way to counteract this is to have a stock question you can go back to which is blank and you fill in the question itself on the spot, either orally or by writing it on the board. It takes students more time to answer the questions you pose via a clicker than when you ask them to raise their hands. Given that you get more honest answers and a greater level of participation, this delay is probably worth it, but you will notice it in your lesson plans. It is tempting to just keep going with the clickers in a lesson and lose some of the valuable inquiry time in lessons, but remember that they are a shallow form of participation and interactivity. Use them sparingly and when you want to find student misconceptions, rather than a way to facilitate pure lecture style teaching. If you want to read some of the research on clickers, check out this study. There are I’m sure lots of studies out there that discuss the use of clickers, this one was just convenient to find. If you have other research you’d like to share, please do so in the comment section and we can all look at it.